Our faculty members represent a balance of traditional research interests and applied professional experience through a wide variety of programs. Across the disciplines, our faculty members hold advanced degrees from the Ph.D. and J.D. to the M.A., M.B.A. and M.Ed., among others. Many have also served as corporate CEOs and vice presidents. We welcome the submission of CVs and resumes from qualified candidates (with a master’s degree or higher) who are interested in teaching as adjunct faculty in SCS. Interested parties should send a statement of interest and a current CV to scsfaculty@georgetown.edu to be considered for new positions. Candidates may choose to submit additional information such as sample syllabi or course evaluations, for example. If you are interested in teaching for professional certificate programs, please send (1) your resume/CV, (2) a short statement of purpose explaining your teaching style and which course or courses you are interested in teaching, and (3) a sample syllabus to ccpeacademics@georgetown.edu with the subject line “Adjunct Faculty Application.” Please note that all adjunct faculty must be eligible to work in the United States. Please note: We may not have an immediate need or opening for someone with your background and experience; however, we accept applications in all disciplines on a rolling basis. Your information and materials will stay on file and be active, and you will be contacted if we have an opening that is a match for you. 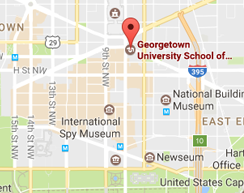 Many adjunct faculty members are also included within the Collective Bargaining Agreement between SEIU Local 500 and Georgetown University. You can find out more about this agreement on the University Adjunct Faculty page.